As a native North Carolinian, a love for barbecue runs in my blood. 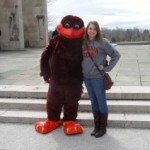 This weekend, I made a day trip down to North Carolina from Blacksburg to visit Elon University, where I will go for my master’s degree next fall, and to stop at one of my family’s favorite barbecue restaurants. Prissy Polly’s Pig-Pickin’ Barbecue, founded in 1991 in Kernersville, N.C., ranks highly on my list of favorite BBQ stops. When we lived in Kernersville when I was young, eating at Prissy Polly’s was almost part of the weekly routine. 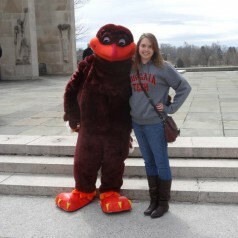 It had been a decade, if not longer, since I’d last been, and I was quite happy making my return visit. 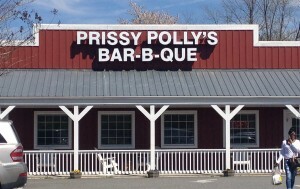 Prissy Polly’s offers both styles of Carolina barbecue: Eastern and Lexington. The menu offers a wide variety of entree plates, vegetables and desserts. 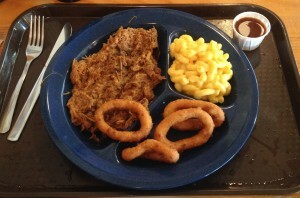 I was quite happy with my half-pound BBQ tray with a side of mac & cheese and hushpuppies (right). Other menu items include fried chicken, pulled pork sandwiches and baby back ribs. Be sure to save some room for a dish of banana pudding, pecan pie or cobbler, too! The banana pudding is definitely not something you want to miss. If you ever travel through the Greensboro or Winston-Salem area, or if you live in the area, I highly recommend a meal at Prissy Polly’s. It’s an easy stop off I-40, and well worth it! Prissy Polly’s is located at 729 Hwy 66 S, Kernersville, NC, 27284. Visit their website for more information!